Pull out the ibuprofen, Redmond: it looks like the antitrust headache that bothered Microsoft for years in Europe may be coming back: the European Commission is preparing to bring charges against the company worth billions of euros because Microsoft has failed to implement an effective way of offering users alternatives to Microsoft’s Internet Explorer browser on Windows-powered devices, according to a report in the German-language Der Spiegel. After Microsoft had been fined over $2 billion (€1.64 billion) by the European Competition Commissioner because the regulators ruled that it was being anticompetitive by bundling its Internet Explorer browser software with its operating system across millions of PCs sold in the European Union over several years, in 2009 the two sides reached a settlement. Part of that settlement involved Microsoft agreeing to give consumers a clear way of choosing another browser in the future in future versions of its Windows OS. But apparently Microsoft failed to do this with a subsequent version of Windows 7 that was distributed and activated 28 million times. So it looks like the Der Spiegel report is a sign that the authorities may be inching closer to making a move here. The next step in the process is for Almunia’s office to send Microsoft a indictment in the form of a Statement of Objections, and then after several weeks in which Microsoft is allowed to appeal, Alumnia will reassess and potentially apply the sentence. The news is timed quite badly: it’s coming just weeks before Microsoft is due to start a $1.5-billion marketing push on Windows 8. It has a big event for the media scheduled for October 26. But it’s also an ironic turn of events for Microsoft: Internet Explorer is no longer the most dominant browser in the region. 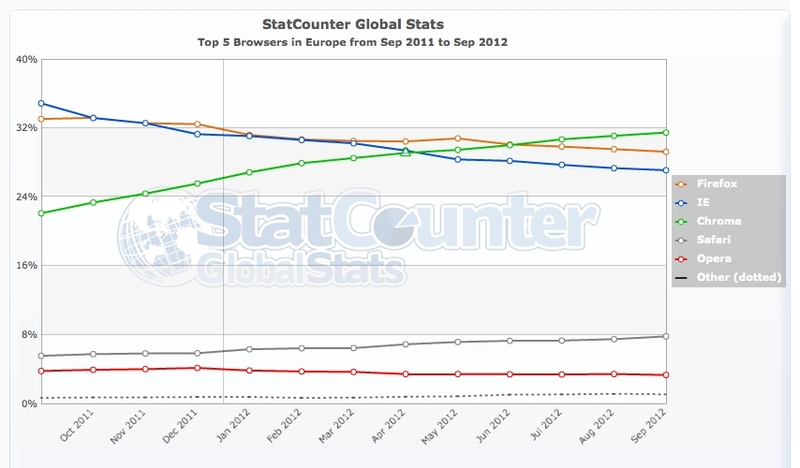 According to figures from Stat Counter, it now sits in third place in Europe behind Google’s Chrome and Firefox (see graphic below). Still, Windows remains the most popular PC operating system, and this was an agreement that Microsoft has not held up, by its own admission. Microsoft says that it will get us a response for this story as soon as possible, and we will update as we learn more. We have also reached out to the European Commission for a comment.